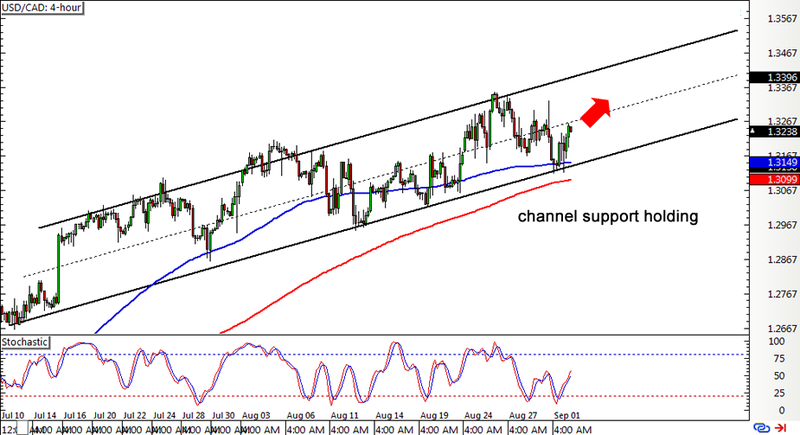 First up, here’s an update on USD/CAD’s rising channel, which is visible on the pair’s 1-hour and 4-hour forex charts. The pair just bounced off the channel support and the 100 SMA while stochastic is starting to move out of the oversold zone, indicating that buyers are still on top of their game. Apart from that, the 100 SMA is safely above the longer-term 200 SMA, confirming that the path of least resistance is to the upside. This suggests that a move back to the channel resistance around the 1.3500 major psychological level might take place. If you’re hoping to ride the trend, you could still hop in at market with a stop below the recent lows of 1.3120 or wait for another test of the channel support. Here’s another comdoll channel you might wanna pay attention to. 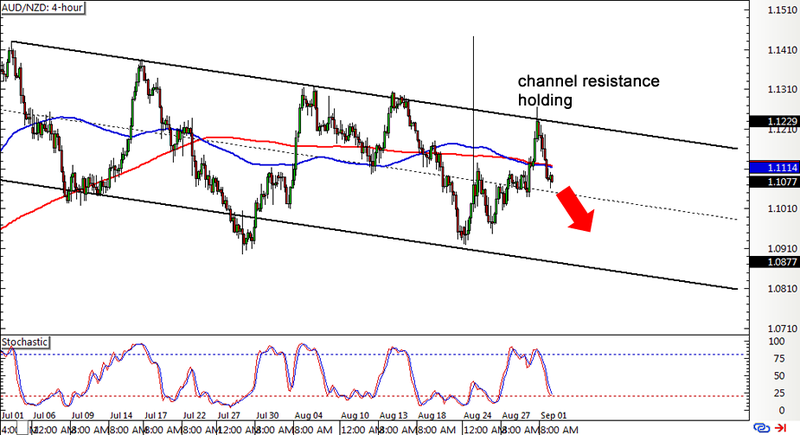 AUD/NZD has been trending lower, moving inside a descending channel pattern on its 4-hour forex time frame. The pair just bounced off the channel resistance around the 1.1250 minor psychological mark and is currently testing the mid-channel area of interest. Stochastic is still pointing down, hinting that further declines are possible. Meanwhile, the moving averages are crossing back and forth, barely offering any good clues on where the pair might be headed next. A break below the 1.1000 major psychological mark could set off a drop down to the channel support at the 1.0800 handle while a bounce could spur another test of the resistance. Last but not least is this sideways range on EUR/GBP’s 4-hour forex chart. Yep, this one’s still intact, fellas! In fact, the pair is currently testing the resistance around the .7400 major psychological mark, still deciding whether to make a bounce or a break. 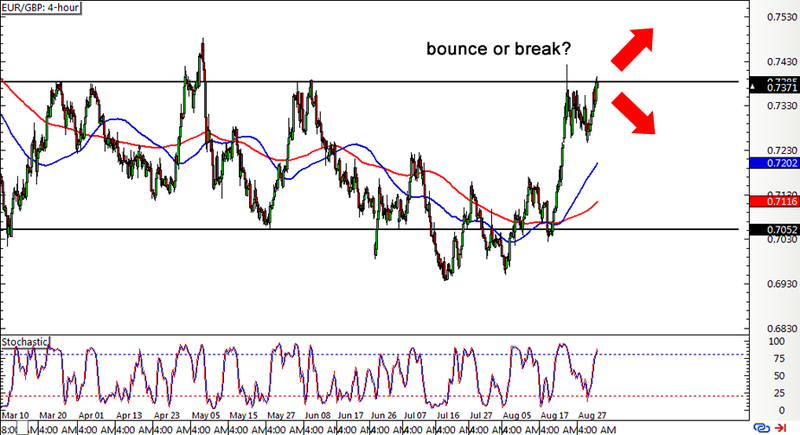 If the top of the range continues to keep gains in check, price could move back to the bottom at the .7050 minor psychological level. However, stochastic is still heading north while the 100 SMA crossed above the 200 SMA, both suggesting that buying pressure is building up. In that case, an upside break past the range resistance could lead to a 350-pip rally, which is roughly the same height as the range.